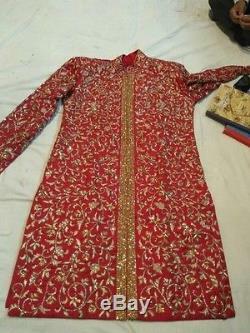 100% hand embroidered sherwani that was never worn. 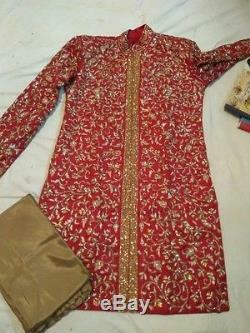 It's embroidered with zardosi, swarvoski crystals, Dabka, beads, and sequins. Chest size is a 46. Should to shoulder - 20. 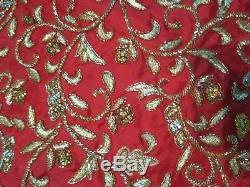 The item "Red Hand Embroidered Sherwani" is in sale since Tuesday, March 7, 2017. 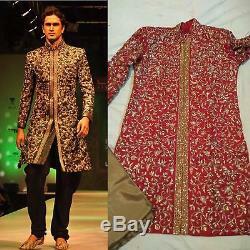 This item is in the category "Clothing, Shoes & Accessories\World & Traditional Clothing\India & Pakistan\Kurta". The seller is "gujarati-girl" and is located in Sterling Heights, Michigan. This item can be shipped to United States, Canada, United Kingdom, Denmark, Romania, Slovakia, Bulgaria, Czech republic, Finland, Hungary, Latvia, Lithuania, Malta, Estonia, Australia, Greece, Portugal, Cyprus, Slovenia, Japan, China, Sweden, South Korea, Indonesia, Taiwan, Thailand, Belgium, France, Hong Kong, Ireland, Netherlands, Poland, Spain, Italy, Germany, Austria, Israel, New Zealand, Philippines, Singapore, Switzerland, Norway, Saudi arabia, Ukraine, United arab emirates, Qatar, Kuwait, Bahrain, Croatia, Malaysia, Brazil, Chile, Colombia, Costa rica, Dominican republic, Panama, Trinidad and tobago, Guatemala, El salvador, Honduras, Jamaica.